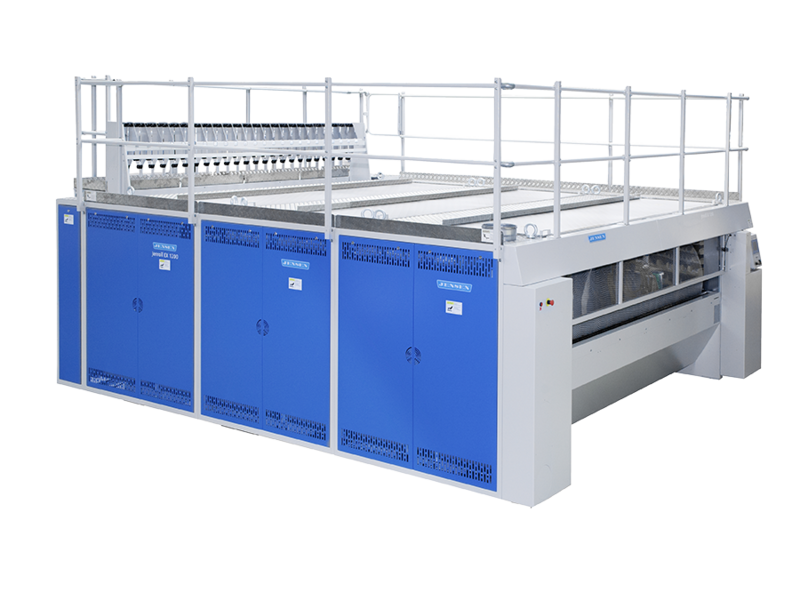 High-capacity, steam heated ironer with optimized evaporation capacity by the flexible chest. Increased contact angle thanks to the flexible chest adapting to the roll diameter like a "band brake". 25 to 50% higher evaporation capacity over time compared to a conventional fix chest ironer. Up to 3 rolls with a roll diameter of 800, 1000 and 1200 mm available. Excellent finishing quality and minimum friction by the use of carbon steel material for ironing. Reduced heat radiation as the higher capacity of a 2-roll Jenroll Express can replace a conventional fixed chest ironer using more rolls. Reduced cubic content and less material to heat up in the morning thanks to the flexible chest. Optimum heat conduction by use of carbon steel for the chest. Minimum heat escape thanks to thorough insulation of chests, pipes and steam components.